Raising money can be a difficult task for church groups, school organizations, the local PTA, sports teams, and others who depend on donations and fundraisers for the money they need. With fundraiser discount cards, you will see that the task is much easier, and that you can raise the amount of money you need far quicker than with other methods you may have relied on in past years. Whether you’re looking for one method to use on its own in your efforts, or something to combine with the other things your organization is doing to raise funds, it’s important you understand how fundraiser discount cards work and their benefits so that you can make an informed decision. Unlike some other products, customers actually want and need this one. When the budget is tight, not many people need jerky, a candy bar, or item out of a fundraising catalog. True, some will buy from you simply to show their support for your fundraiser, but when you have a product that is really valuable and can help people save on things they normally buy on a regular basis, you will find the sales are easy. Fundraiser discount cards are packed with value, and make it possible for the card holder to save money each time they visit a merchant listed on the card for one year. Your cards will have a minimum of a dozen deals on the backs, everything from a buy-one-get-one-free deal at a local restaurant, to money-saving discounts on such services as hair color or cut, oil change, etc. Most organizations sell the cards for $10 each, and you can imagine the amount of money the customer will save over time. When people realize the savings they can enjoy every week or every month for an entire year, the sales are easy! Super profits for your organization. Unlike many fundraising items which limit profits to 50% or 60%, the profit margins you can reach with fundraiser discount cards go much higher, in fact above 100%. This is nearly unheard of in the fundraising industry. How can you earn more than 100%? With every 1,000 cards you order, you get 200 free. Profits begin at 50% and rise incrementally from there, depending on how large your group is, how many cards you order, and how many you sell. Regardless of which level your organization fits in, the fact that you have a product which will readily sell makes all the difference in how much money you can raise, and the time required to accomplish your goals. Basically, a product that customers want and that sells easily will result in success far quicker than trying to sell a product people really don’t want or need. An easier, less stressful way to raise the funds you need. With so many fundraising activities and products, there is lots of work and worry involved. Take for instance some of the common methods of raising money for a church group: bake sales, spaghetti suppers, cook books. These things all cost money initially, and considering the work and effort involved, the profitability isn’t all that great. At the end of the day, you may have a few hundred dollars, and is it worth it considering all of the effort you put in? With fundraiser discount cards, all you do is choose the merchants in your area who you would like to participate and discuss the details with them. Once set, simply work with the card company to have your cards designed and printed up, then begin selling when they arrive. Simple, easy, and most importantly, effective. Distribute the cards to your group, and you’re ready to begin what will be the most successful fundraiser you have ever been involved in! It’s always a little stressful to do something you’ve never done before, particularly when you’ve been relying on the same methods for raising funds year after year. Sometimes, staying in a rut seems more comfortable, safer somehow. 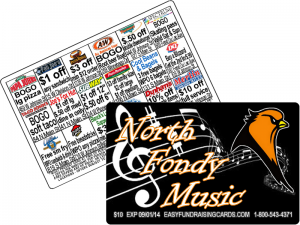 This year, try fundraiser discount cards – and be prepared to be amazed.